The Supcoin (SUP) is a new altcoin that has just recently launched as a CPU only coin using a new algorithm called PLUCK, but it has quickly gotten a ccMiner fork from djm34 (source) adding support for GPU mining on Nvidia-based GPUs. The ccMiner fork with Pluck support for mining Supcoin (SUP) is available for download below, it is compiled for Compute 3.0 or newer Nvidia-based graphics cards, so it will not work on older. 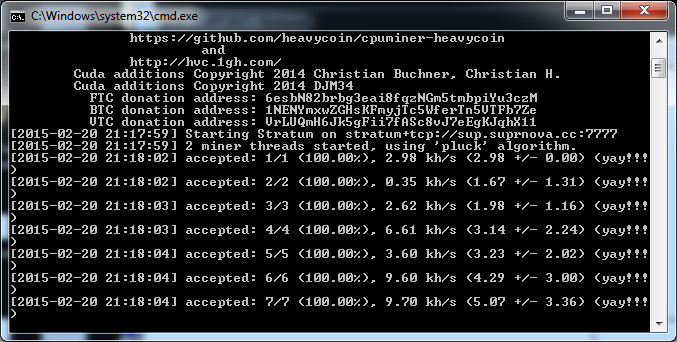 We have taken the ccMiner for a quick test to tee what hashrate you can expect to get from it and compare it to what the Pluck CPU miner from Wolf0 currently provides in terms of hashrate. There is still no AMD GPU miner available, but most likely we are going to soon seen one available considering that the algorithm was quickly ported on Nvidia it is apparently not very GPU resistant. The results cited below are for the hardware (CPU and GPU) running at their stock frequencies with no additional user overclock, do note that only the GTX 960 is an ASUS Strix card that is factory overclocked.